Kick off your visit on the 1st (Fri): see the interesting displays at Banque Du Liban Museum and then shop like a local with Hamra Street. Keep things going the next day: explore the fascinating underground world of Jeita Grotto, then wander the streets of Beirut Souks, and then take in the spiritual surroundings of Mohammad Al-Amin Mosque. To find reviews, maps, traveler tips, and other tourist information, you can read our Beirut online driving holiday planner . Amman, Jordan to Beirut is an approximately 5.5-hour combination of bus and flight. Traveling from Amman in February, expect Beirut to be a bit warmer, temps between 23°C and 13°C. Wrap up your sightseeing on the 3rd (Sun) to allow time to drive to Bcharre. Sitting at 1,500 m (4,900 ft) above sea level and nestled between a mountain and a valley, Bcharre offers holiday goers breathtaking views. 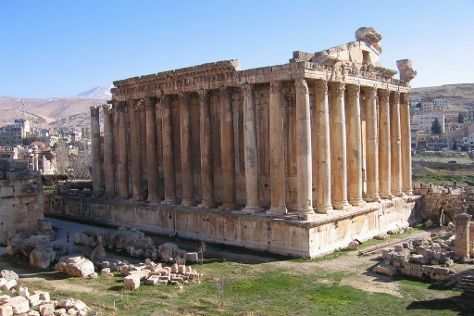 Your cultural itinerary includes sights like Temples of Baalbek and Baalbek Roman Ruins. Popular historic sites such as Qadisha (Kadisha) Valley and Deir Qannoubin are in your itinerary. There's lots more to do: see the interesting displays at Gibran Museum, take in the spiritual surroundings of Deir Mar Elisha, get outside with Ehden Adventures, and steep yourself in history at The Cedars of God. To see reviews, maps, where to stay, and tourist information, go to the Bcharre visit website . Traveling by car from Beirut to Bcharre takes 1.5 hours. In February in Bcharre, expect temperatures between 23°C during the day and 13°C at night. Wrap up your sightseeing by early afternoon on the 6th (Wed) to allow time for travel back home.